Earl Smith, always with pipe in hand, shown against a landscape of his own devising. Smith's homes, in a modest modern style, attracted young families seeking inexpensive quarters. 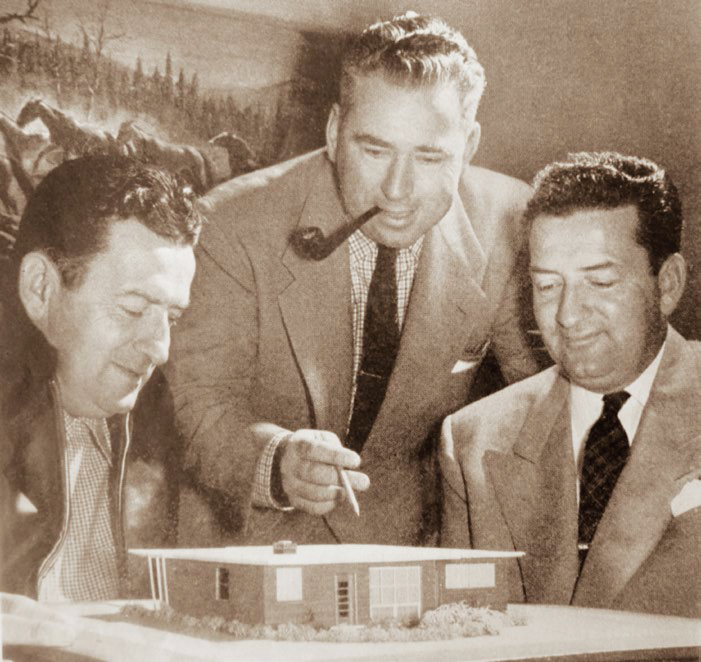 Earl Smith, flanked by brothers Rae (left) and Henry (right), looks over a scale model of one of his company's flat-tops, 1954. No one built homes for less money than Earl W. Smith. He built what he called "economy homes in a modern motif," putting them up quickly and selling them to young families who could not otherwise have afforded a home. Smith's success also came quickly. He built his first flat-roofed home on spec in 1947 in the East Bay city of El Cerrito, and within a few years was building them by the thousands. Smith won fame as the first to build homes with 'flat tops' and concrete slabs for the mass market, innovations he adopted to keep costs down. In a 1954 ad, Smith bragged about his "insulated planispheric roof, an Earl W. Smith exclusive…cooler in summer, warmer in winter"; and his "insul-duolithic floor," which he claimed was superior to wood construction, "drier, warmer, termite and beetle-proof, squeakless and fireproof." 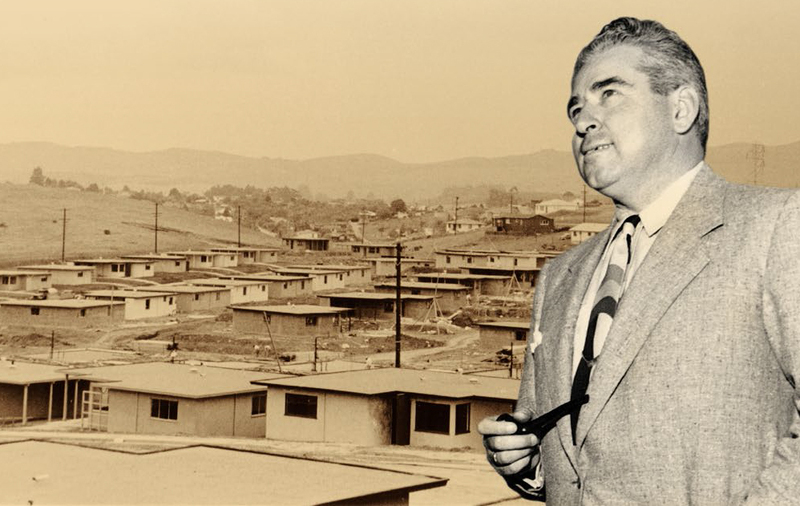 'Flat Top' Smith (1918-2000), as he was dubbed, was praised by Life magazine the prior year for producing the "best buy in low-cost development houses" in the country. The same article also focused on Joe Eichler. For 'He Builds Bargains to Live In,' a six-page 1954 profile, Saturday Evening Post wrote, "Because [Smith] gave the public what no one else knew it was waiting for—the combination of modern design and just about the lowest price in the country—he has started a trend and hit the jackpot." When Earl's brother Henry, the family firm's sales manager, told a competitor they could produce a two-bedroom home with a carport and "a few extra gimmicks" that would sell for less than $7,000, the Post's Lee Geist wrote, the response was "you're kidding! It can't be done!" By 1955, according to the shelter magazine House and Home, Earl W. Smith Homes was America's fourth largest homebuilder. "He took a chance on modern architecture's direct approach," the magazine wrote, "and decided he wanted a new type of house with a flat roof." Smith's success inspired others, the Post said, quoting a federal housing official saying, "Smith was the first to use flat roofs either for tract building or low-cost jobs, but today you can see copies all over the country." Pretty good for a guy who claimed he didn't like modern architecture. "I was the original Cape Cod kid," Smith told the Post of his own taste for homes of steep-roofed construction. "I thought modern was too cold and brutal, didn't like it at all." Also in 1955, Smith, a former actor and born educator who loved to "orate," according to his daughter-in-law Marjie Smith, became president of the National Association of Home Builders. He got the job because of his garrulous nature and because his peers admired that the eighth-grade dropout had started out as a carpenter's assistant at age 14. "He's pounded nails himself," they thought.